Tools: You'll need a super long circular for this - not to knit in the round, but simply so that you have enough space for the amount of stitches you will be knitting. This pattern works with any yarn, of any gauge - we've made it with Twinkle, soft chunky, and we've made it with Artyarns Regal silk and Jade Sapphire Cashmere. You will have to do the math to figure out how much yarn you'll need. What does this mean? You'll need to knit a swatch and then based on that calculate how many skeins of whatever fiber you want to use you will need. 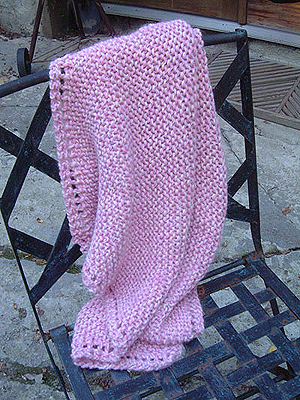 The basic concept is that you start at one corner with three stitches - and increase the number of stitches on each row until you have the diagonal length for the size blanket you want (the math to figure out how many stitches you need to end up with is in the pattern). Then you begin DECREASING. The edging detail is very simple - you simply do a yarn over before the last two stiches on every row, which creates an eyelet pattern. This pattern also works as a shawl pattern, depending upon the fiber you use - you simple stop knitting when you get to the width you want - and it becomes a shawl.